Dunkin' Donuts glazed donut breakfast sandwich. Fast food breakfast offerings have exploded in recent years with chains competing fiercely for your morning dollar. But recent weeks have brought some especially enticing offerings to Chicago. 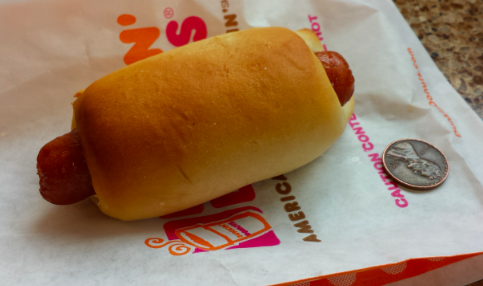 While the whole country got McDonald’s egg white sandwiches earlier this year, only Chicago and Fort Meyers got the experimental Dunkin’ Dog this week for a limited time. Chicago was also chosen as one of the early sites for the roll out of Starbucks new upscale pastries from San Francisco based La Boulange. The Chicago Tribune reports that they will include chocolate croissants, lemon loaves and chewy chocolate meringues. We couldn’t yet try the fancy new Starbucks offerings but we did stop in Dunkin’ Donuts this morning to try the Dunkin’ Dog ($1) as well as the glazed donut breakfast sandwich which came to town last month. The dogs are two cheesy Ekrich sausage links wrapped in a soft, slightly sweet dough. Not much bigger than a wiener wrap, it delivers a good chew and nice smoky finish for a mere 180 calories — that is if you eat just one. The glazed doughnut breakfast sandwich, however, is kind of a wreck. Its sweetness plays nicely off the salty bacon, but the split doughnut falls apart in your hands and turns them into a sticky mess. Don’t even think about driving while you’re eating this. Once we get our hands on the new Starbucks La Boulange pastries, set to launch August 20, we will discuss them on the Morning Shift. But in the meantime, tell us about your favorite grab and go breakfast in Chicago. I’ll start: It’s the rich and buttery Fritz Pastry ham and cheese croissant ($2.95) and a Metropolis iced coffee sold together at Dollop Coffee. Monica Eng is a WBEZ producer. Follow her @monicaeng.